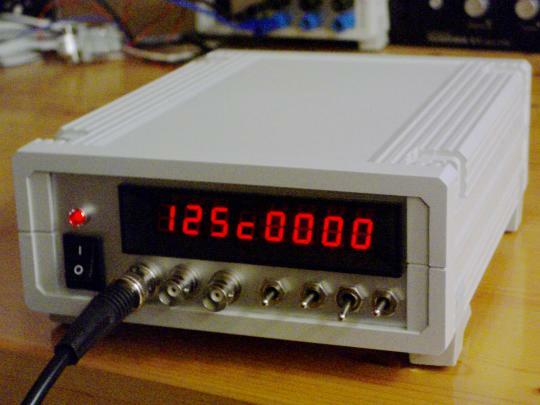 In counter mode it provides 1Hz resolution up to 100Mhz. In timer mode maximum resolution is 0.0000001 Hz up to 1Hz. Resolution is reduced by one digit for each additional decade. 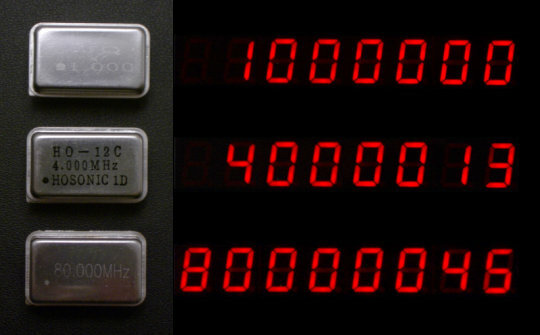 Multiple frequency updates per second by employing a sliding window for calculation. 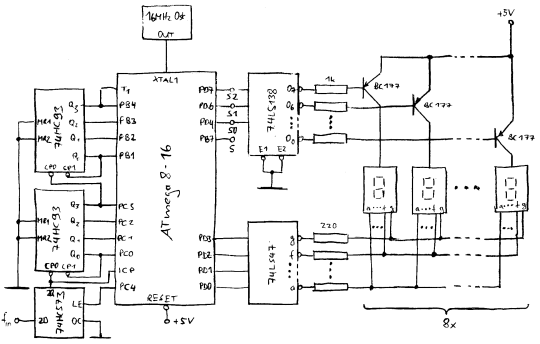 In case the AVR should be programmable in circuit, a few modifications must be made. In essence all third parties on wires used for programming are isolated using 47k resistors. 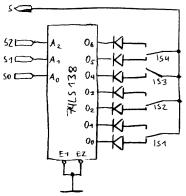 The resistors in combination with Mega8 gate capacity create a low pass. This is software compensated using increased settling time for the external counter. The crystal osciallator in the bottom right corner is for testing circuit and software. 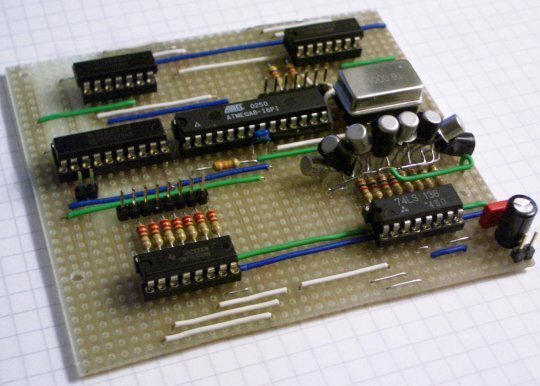 This is the final board that will be put into the device. 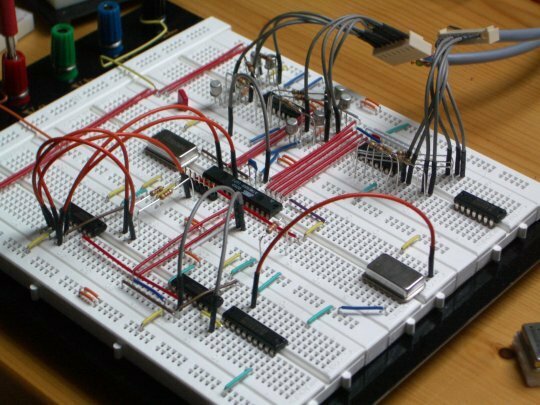 It has connectors for power, 7 segment code, digit selection, in circuit programming and TTL signal input. Board size is defined by the case so the BC177s are mounted somewhat tight. 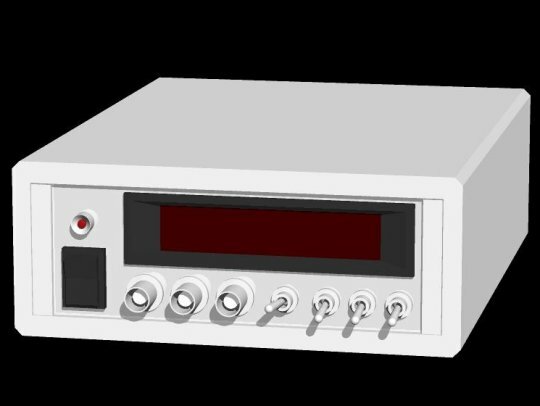 3d model of the front panel layout. Only TTL input at this point but working. The "c" represents the comma in high precision timer mode. Files found in the downloadable archives below are released under the GNU GPL. 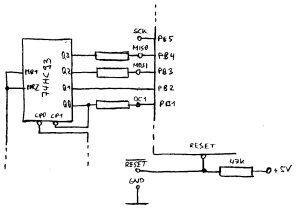 Beautiful but where can i find a cao view of the schematic? How many dwarfs are there in snow white and the seven dwarfs?